A powerhouse of protein and fibre to boost your energy and manage your weight. Quinoa and beans boosts satiety because of their high-quality protein and fibre content. Eating more protein can increase your metabolism, thereby increasing your ability to burn fat. Fibre helps slow the absorption of sugar by improving glycemic control. 1Preheat the oven to 400 F. Place the beets in the center of a large piece of tin foil, drizzle with olive oil and season with sea salt. Wrap the foil around the beets to enclose and place on a baking sheet; bake for 30 minutes or until done. To check for doneness, poke with a fork. Remove and allow to cool slightly. 2Whisk together lemon juice, zest, olive oil, garlic and sea salt and pepper in a bowl. 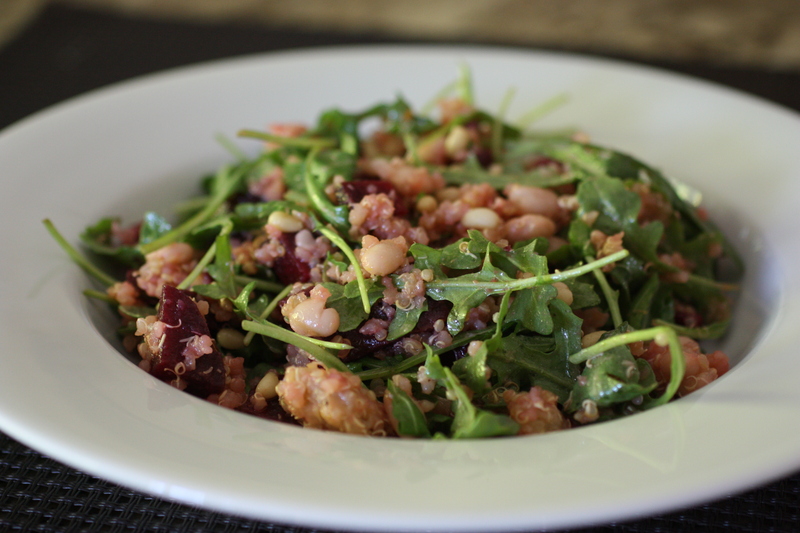 3Combine the arugula, beets, quinoa, white beans or Chickpeas and pine nuts and toss with the dressing. 1Rinse and drain beans or chickpeas. Place in a bowl and cover with plenty of cold water and baking soda and allow to soak for 12 hours or overnight. 2Once soaked drain and rinse. Transfer to a large pot and cover with twice the amount of cold water. Bring to a boil, cover and allow to simmer for one hour or until cooked. 3Drain and allow to cool. Once cooked they can be stored in the fridge, covered for up to 3 days.